According to experts, in the case of a head cold, exercise can speed healing. But they’re quick to point out that “head cold” means just that: a sniffling illness with symptoms restricted to above the chin.1 This can include a generous assortment of symptoms: sore throat, sneezing, earache, congestion, runny eyes and nose. Providing there’s no fever, there’s no reason to hang up the sneakers, experts say. If it seems counterintuitive to exercise when you feel stuffy and miserable, consider that exercise prompts you to breathe deeper, which in turn can clear some of the yucky mucous out of your sinuses and nasal passages. And, easy exercise triggers the immune response. Take a 2008 study from the University of Illinois that divided mice into three groups.2 All the poor mice first were infected with influenza. One group was then made to remain sedentary for three days, another performed light exercise (the equivalent of an easy jog daily), and the third group was prompted to exercise vigorously—2.5 hours on the treadmill. At the conclusion of the experiment, more than half the sedentary mice died, but only 12 percent of the easy exercisers! It’s interesting to note that the marathon mice fared worst: 70 percent of the vigorous exercisers died. The bottom line seems to be that yes, you should exercise, but no, you shouldn’t break a sweat when you’re sick— and again, this only applies if your symptoms don’t involve fever, coughing, intestinal issues, or other problems below the neck.3 Activities like walking, tai chi, yoga, easy bike rides would be helpful, but running, lifting weights, Zumba, and other intense workouts that leave you panting aren’t normally advisable when you’re sniffling. And if you have fever or more severe symptoms, rest indeed may be the thing for you. A few provisos here. First, if you haven’t worked out since Bill Clinton was President, the onset of sickness is no time to first institute your regimen. Rather than invigorating you, working out might stress your out-of-shape body and make you even sicker. Also, be respectful of the healthy people around you. Don’t show up at the gym coughing and hacking and sneezing and blowing your nose. Sure, it might get your blood pumping and help you to feel better, but all those people in the gym will get exposed to your germs. 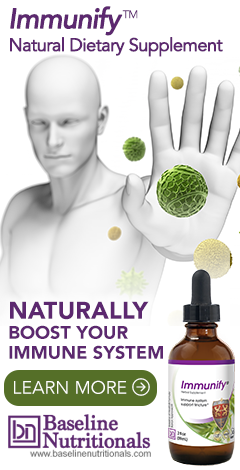 And in fact, that may be how you got sick in the first place—working out hard at the gym where somebody had a bug—a good reason to take a high-quality immune boosting formula before going to the gym during flu season. While light exercise seems to boost immunity, study after study confirms that intense workouts depress immunity for a short time. For instance, a study of Spanish soccer players found that before a match, they had normal levels of immunoglobins, which fight off infection, in their saliva. Right after the match, those levels took a sharp decline. Likewise, a study of runners in the Los Angeles marathon found that one out of seven participants got sick shortly after the event. Also, those who ran 60 miles a week in training for the marathon got sick at twice the rate as those who trained only 20 miles a week or less. Certainly, immunity from colds and flu isn’t the only factor at play in determining how much you should exercise, and when. We’ve reported here numerous times on how exercise helps with everything from lifting depression to increasing lifespan, and we’ve also noted the advantages of exercising daily, not just a few times a week. It’s tricky finding the right balance, exercising just the right amount to stay healthy without wearing yourself down. The bottom line is that 40 minutes or so of light to moderate daily exercise, including both aerobics and strength routines, is essential to good health for most individuals. And while more intense exercise might make you more vulnerable, few marathoners would tell you they regret completing the 26.2 miles because they got a cold at the end. You need to let your own body be the guide. If you’re working out for two intense hours daily and getting sick every month, you’re probably overdoing it. Also, if you’re training that hard, you need to take immune-boosting supplements and make sure your diet supports your energy expenditure. Simply adding a little protein to your diet if you’re a vegetarian doing endurance events might boost your immunity to a surprising degree. On the other hand, if you’re working out for 40 minutes three times a week but still have 50 extra pounds to lose and pre-diabetic numbers, you’ve got to pick up your game.